Many studies have demonstrated that investment in women and girls strengthens democracy and weakens authoritarianism, makes families healthier, peace agreements more durable and societies less vulnerable to extremism, violence and terrorist recruitment. Unfortunately, many studies also show that gender discrimination and physical assaults on women are global and systemic in nature. From the Me Too movement, women’s marches in Washington, NYC and Boston, all the way to the City Council in Yerevan, it has become painfully clear that violence against women is a worldwide phenomenon. 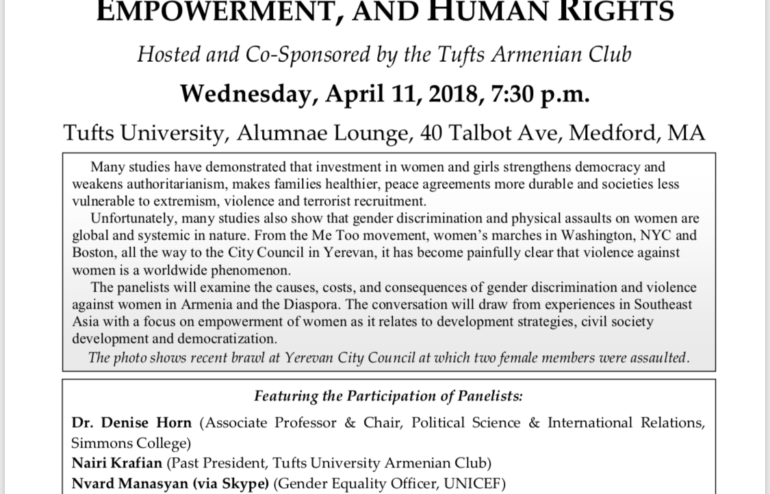 The panelists will examine the causes, costs, and consequences of gender discrimination and violence against women in Armenia and the Diaspora. The conversation will draw from experiences in Southeast Asia with a focus on empowerment of women as it relates to development strategies, civil society development and democratization. Free and open to the public. Reception and refreshments immediately following the program and question-and-answer session. Contact hq@naasr.org or 617-489-1610 for more information.